BM Cool Menu help you show menu with many configs for color. You can config almost color on menu (text, background, active background, border). Start Level: Level to start rendering the menu at. Setting the start and end levels to the same # and setting 'Show Sub-menu Items' to yes will only display that single level. End Level: Level to stop rendering the menu at. If you choose 'All', all levels will be shown depending on 'Show Sub-menu Items' setting. This module support for VirtueMart component. This module show your items with images and descriptions on two parts (left or right). This module support responsive, it display nice on every device and every screen size. You can get data from categories or from specific items. Resize type: SCALE FILL, SCALE INSIDE, SCALE OUTSIDE, CROP, CROP RESIZE, ORIGINAL IMAGE (select this option if you don't want image was resized). This module support for K2component. You can config to show image on left, right or top. This module support for content component. This module show your articles with images and descriptions on two parts (left or right). This module support get images from : Intro Image, Full article image or Intro Text. - This is a gallery to show products with many amazing effects when change page and many beautiful effects to show title & desciption when hover on images, module support for VirtueMart component. - Module support 10 effects when change page, images will fly very beautiful, you can't leave your eyes from images when they change. - You can't believe that beside 10 effects for paging, it support 10 effects for hover event on images. It's true! You will surprise with effects for hover, they are smooth and beautiful. - You can select data in categories or specific items that you want to show. - You can config color for button of pagging. - Module support responsive, you can config how you want it display on each screen size. - Select Resize Type: Scale fill, Scale inside, Scale Ouside, Crop, Crop resize. - Select hover effect: Support 10 nice effects when hover images (Style1 to Style10). When hover it will show title, descripiton and button readmore. - W1024 columns, W768 columns, W480 columns, W320 columns,W240 columns: Module support you config number of columns for each screen size. - Buttons color: color for pagging buttons. 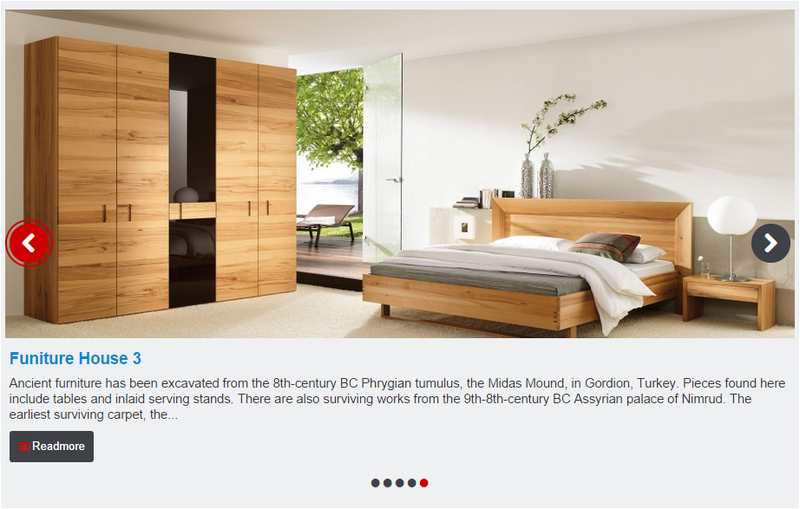 Module BM Smooth Slideshow For JoomShopping is an Amazing slideshow for products. 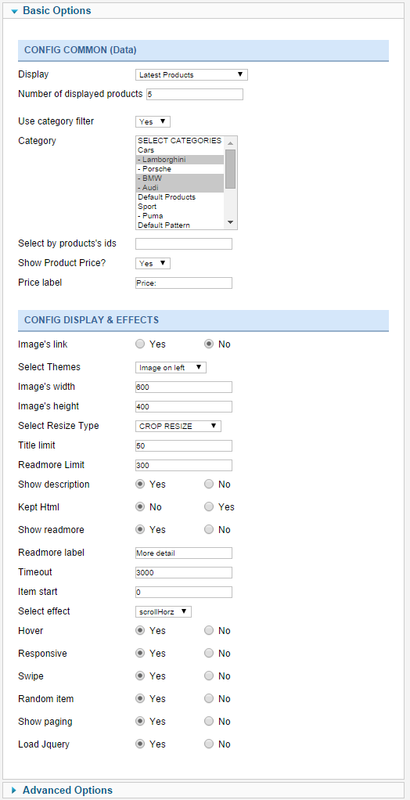 This is what you need for slideshow or slider, module support for JoomShopping component. This Module give 8 themes, you can select the theme that you want and you will be happy with it. Each theme support to show title and description with different ways. You can select data in categories or specific products that you want to show. This module support you config color for title, desciption and special that you can config color for button and active status of button. You can turn on or off pagging too. The Module support to show products's images. Show paging: Yes or No. Load Jquery: Yes or No. Module BM Accordion For VirtueMart show your products in the acoordion. This module support VirtueMart component . You can use this module on the top of your website as a slideshow. Your website will be more beautiful. This Module support 2 direstions are Horizontal and Vertical. Support 3 styles: Dark, Light, Sticth. You can config with and height of Acoordion, if you want it auto resize follow screen's you can set width or height is 'auto'. Support Select Resize Type: Select a Type to Resize Images (6 types, you can use ORIGINAL IMAGE type if want to show image not resized). Support Get Images From: Where do you to get a image from an article (Full article image, Intro Image or Intro Text). This module support 4 themes to show items with different effects.